Jennifer Bull of Fort Jones, California, took this beautiful 19-inch 3x3 blacktail on opening morning of the rifle season in the Trinity Alps Wilderness. 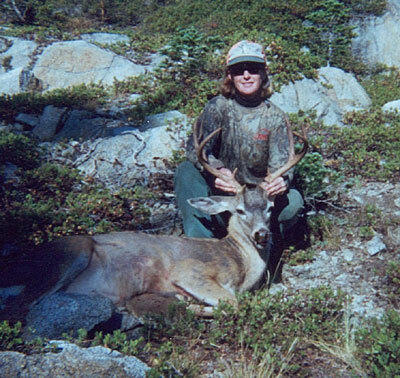 Jennifer has been hunting for several years and this is her first buck. Jennifer's hunting party is proud of the fact that she passed on several smaller bucks in previous years, holding out to harvest a mature buck with her open sight 30-30. Jennifer is a conscientious and selective hunter. Jenn's hunting ethics should stand as a benchmark for all of us to strive for  especially at a time when the actions of all hunters are under scrutiny by the anti-hunting community.